I always knew my father really liked computers, but never realized the extent of his obsession until I was in middle school. After a long day at school and various extracurricular activities, I returned home to resume some school assignments on the computer. Only I encountered a problem: the computer was lying in tiny little pieces across our living room floor. In shock, I remember stepping towards the defunct computer, as if in a trance. My foot was subsequently pierced by one of the computer’s small little screws, hidden in the rug. It was at this point that I lost it: In the mind of this middle school overachiever, all of my hard work (my papers, my power point presentations, etc.) had just been destroyed by my father. I don’t remember exactly what I did; but I remember feeling as if I was about to weep in exasperation. My father rushed in, explaining his decision: “You know how long the computer was taking to turn on? Once I am done, it will go faster.” I felt like crying out, “If the computer works at all!”, but ultimately decided to remain quiet. Needless to say, that night, my father reassembled the computer. The following morning it did work, and yes, it was faster. Speaking of computers, my family has always been PC people. Once, my father got his hands on a Macintosh, a computer which in his opinion ran too slow. However, when he went to take the computer apart to "fix it," he found himself unable to do so. In fact, he had to use his PC laptop to get the information to reassemble it. According to him, Apple makes Macs un-fixable except by those in the Apple Store, thus running a monopoly over computer repair. I bring up this point not to join in the Mac-PC debate, but rather as an introduction to a video to a comedy skit, which in my opinion perfectly represents the current events of the 2000s: Apple Presents the IRack. Not only does it describe the Apple craze that engulfed the United States culture, but it also goes into the foreign policy of the U.S. during this time, in particular the issue of Iraq. When searching for a book about Iraq, I wanted to find a book that brought light to the current events of the U.S. invasion from a historical perspective. I was a bit afraid that if I chose a book focusing solely on current events, I might not get an unbiased approach. 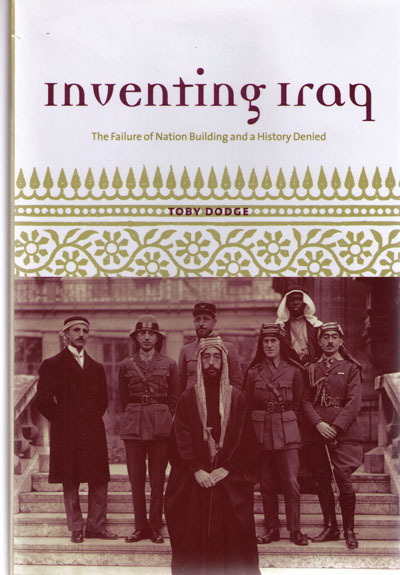 I eventually chose Toby Dodge’s “Inventing Iraq: The Failure of Nation Building and a History Denied.” Although I found the book very interesting, by the time I finished the first chapter, I was worried that many of the concepts were flying over my head. Instead of focusing on the U.S. invasion and occupation, it focuses on Britain’s involvement in Iraq following World War I. The book delved into concepts otherwise foreign to me – the Mandate System, inner-workings of the League of Nations, and land policy. In the Preface and the Conclusion (in my opinion, the most accessible parts of the book), the author makes comparisons between the British and American control of Iraq. Ultimately, although the book was challenging, I learned a great deal. The rejection of Ottoman institutions: The Ottoman Empire was viewed as a negative and corrupting force by the British. Thus, when the British took control of Iraq, they rejected these institutions, favoring to create their own. This led to many problems about how to maintain control of the country. 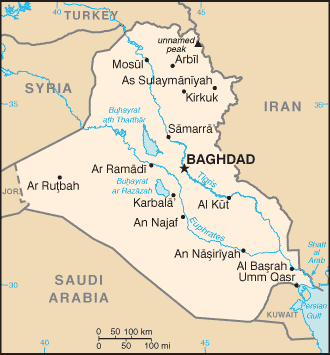 The United States, in contrast, wanted to use the existing institutions of the Sadam Hussein regime to maintain order; changing them once order was established. However, the institutions were weak because of economic sanctions and collapsed after the United States invasion. Airplanes and Despotic Power: In order to silence criticism at home, Winston Churchill started replacing “costly imperial troops by the newly formed Royal Air Force” (page 131) in order to maintain order. As less money was spent and less causalities incurred, the British people put up less resistance to the country’s involvement in Iraq. “By relying on aircraft, the Iraqi state developed a modern but nonetheless despotic state power. State institutions did not penetrate society, and therefore the state’s presence became neither permanent nor legitimate to the Iraqi people” (page 145.) Interestingly, I see similarities between modern warfare tactics of the United States, in particular the use of drones. Good job on the blog, Emily! I finally got on, and it's very interesting. I can see you're keeping yourself very busy this summer, haha, Have Fun! Hey - don't know who this is, but thank you for the compliment! Keep checking in because I keep putting up new reviews! How does iHop fit in? It's connected to Hi Tech. Whoever said this - I like your sense of humor! I should have started talking about pancakes in this post. The problem is that I don't believe I have ever eaten at the "iHop." You mention interesting points.Also,your introduction from your own experience to the main idea is professional.I like your writing skills. In Iraq,there have some ethnic groups, such as Turkmen,Kurd and others.These groups have animosity to each other and they want to declare their own sovereignty. I think it is main problem in Iraq to establish permanent state institutions.So, the US should eliminate this animosity in order to establish strong government in Iraq. It is fact that Saddam Hussein somehow achieved to control these tribes. Morever,you truly emphasize that British government did not take into account the religion,culture factors and previous institutions when to establish new West one. In general,the institutions were formed in every country by considering religion and culture of people.Otherwise,it is difficult for one country to create permanent and acceptable institutions.